This diamond ring features diagonal twists in the shoulders that is made up of carefully set individual diamonds. A halo of smaller diamonds creates the cushion shape surrounding the princess cut centre stone and has a gentle twist when viewed from the top. Total weight of diamonds is 1/5ct. Celebrate your special day with beautiful bridal rings that have been carefully shaped and set, diamond by diamond. 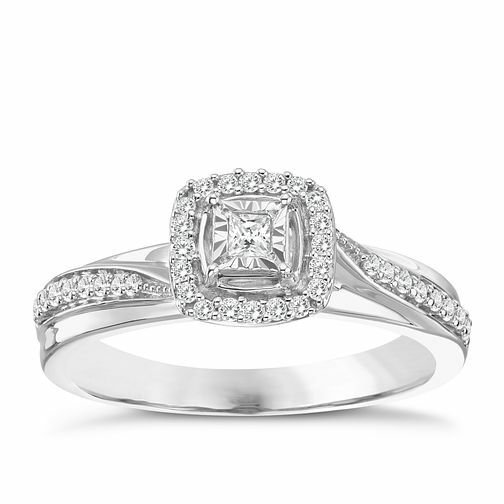 9ct White Gold 1/5ct Cushion Halo Twist Diamond Ring is rated 5.0 out of 5 by 1.